I know, I know. You have been looking at photos of a can of flour for the past couple of weeks. And you’re probably thinking that I am lying on the couch, spooning Nutella, watching The Golden Girls and baking nothing. You’re wrong, my friend. Actually, I have been cooking A LOT lately. Not only that, but also took 2000+ food shots for the most exciting project yet. And no, it is not a book. All I needed was 5-6 golden shots. My dear friends opened their secret cabinets and let me borrow their gorgeous vintage bowls and Ottoman silverware and all the possible combinations made me dizzy. Also, you will not believe whom I cooked for. No, not Her Majesty. She’s way younger and much cuter. And she is the queen of another kingdom – the culinary one. No, not Martha. She’s way more talented and much cuter (sorry Martha, I can no longer hide my jealousy of your prop room). The bad news is I really can’t give anymore details… Just hang on a few more weeks and you’ll read all about it (Update: The secret is out. Here’s the piece Janet Fletcher wrote about my San Francisco-inspired Turkish menu for The San Francisco Chronicle). So, before I can tell you more about this project, here’s a recipe I came up with for a friend. This friend of mine practically lives in his car. He also suffers from hypoglycemia, which results in dizziness if he doesn’t eat small portions of food every two hours. We used to laugh whenever we hear him say “Oh, my blood sugar is low, I need to eat again” and thought that it was just an excuse. But recent tests show that he was in fact right. He usually grabs the first thing he can find and most of the time it’s a package of cookies loaded with trans fats and other nasty ingredients. I wanted to come up with something filling and nutritious that he can stash in his car and grab one whenever he needs to satisfy his immediate hunger. The starting point for the recipe is the granola I baked last month. I took out the fruit puree, replaced brown sugar with honey and played with the rest of the ingredients to make it hold together better. I also included dried blueberries, which is his favorite dried fruit, and packed them individually for portion control. The ingredient list and amounts may look shocking, but if my measurements are correct, each bar is around 300 calories. Considering how filling these bars are, I am thinking it’s not that bad. Line a 10*14 inch rectangular cake pan with parchment paper and set aside. Chop the walnuts coarsely and combine with the rest of the dry ingredients. Stir to mix well. In a small bowl, combine all of the wet ingredients. Stir to mix well. Pour the wet ingredients over the dry ones, and mix until completely blended. Spread the mixture evenly on the pan. Bake for 30 minutes, remove from the oven, score with a knife into 16 equal pieces and return to the oven (makes the actual cutting easier later on). Bake for 15 more minutes and let cool to room temperature. When cooled, cut them into 16 equal pieces, pack them individually and store in an airtight container. Will keep fresh for 2 weeks under room temperature or up to a couple of months in your refrigerator. My granola bars sometimes fall apart. Do these hold their shape well? Also, what is grape molasses? Any alternatives? Cenk, yes I have to admit I was looking forward to something other then the flour photo hehe 🙂 Let me guess, this project of yours… it’s not a book so… are you opening a restaurant or something?? Or a pastry shop?? Or you are helping to concoct recipes for a restaurant?? Am I anywhere close here…? 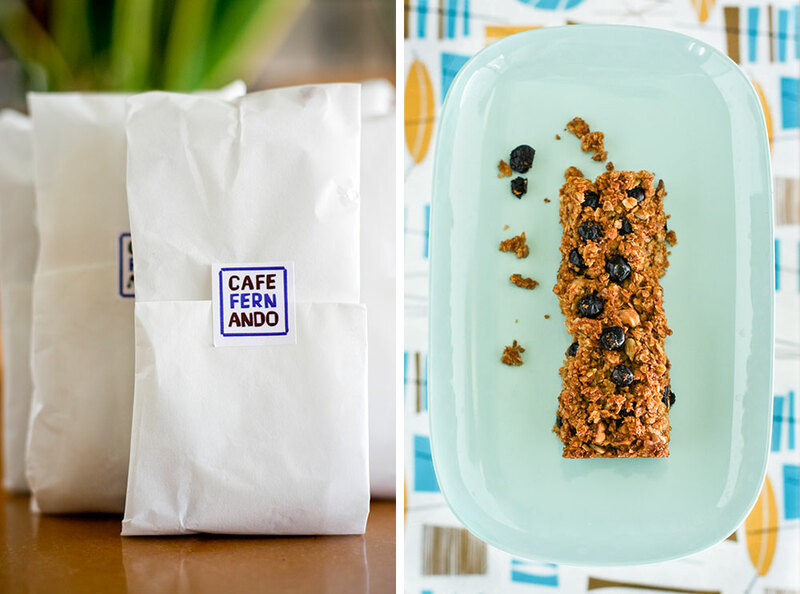 Those granola bars are great, plus you’ve calculated the calories and designed a healthy alternative for your friend with the cute Cafe Fernando stickers – that is sweet of you! Silvia – Glad you liked them! Suganya – Yes, these hold their shapes very well. But you have to wait for them to reach room temperature. Instead of grape molasses, you can use any natural sweetener you like.. maybe agave nectar or brown rice syrup? MariannaF – I wish (not a restaurant but definitely a pastry shop)! Not close… This is a much smaller project but a very exciting one. Glad you liked the bars. that looks awesome and wholesome. yummy! You’re a true friend. The bars looks incredible! I’m so intrigued for what’s to come, Cenk! You’re so thoughtful of your friend. Indeed, it’s dangerous when sugar level is low like one of my neighbours suffering from diabetes. hmmm… are you into food photography? Creating brochures or turkish cooking books? Hello! I love discovering new food blogs! These bars look to-die for!! And that is really nice of you to make them specially for you friend. I have all the ingredients to make them except grape molasses, but I’m gonna try it with some pomegranate molasses that I have. I can’t wait! Cenk, these look fantastic. 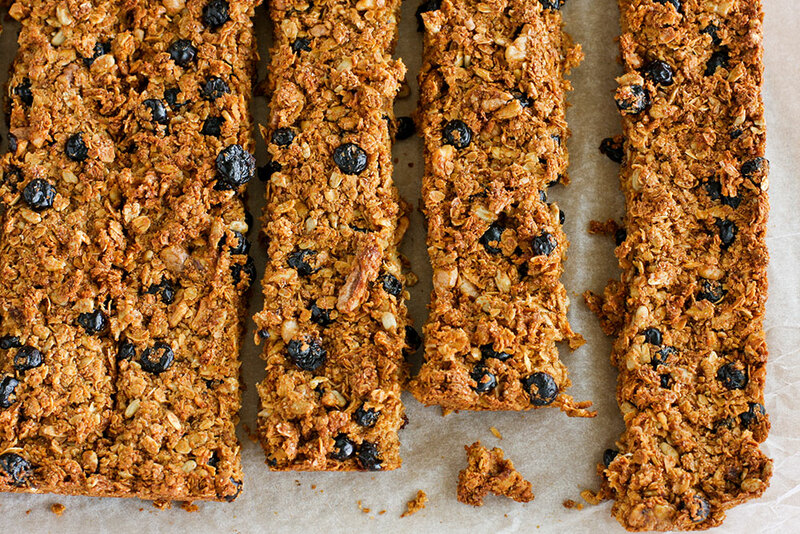 Granola bars are something I like to make often as my son loves them in his lunchbox. I like the blueberries here! ps: waiting for a speacial and detailed macaron recipe. 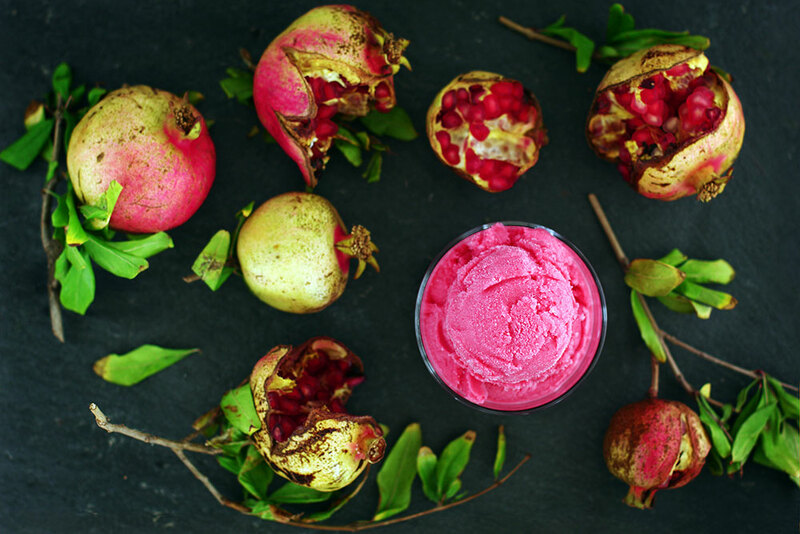 Pixen – Yes, I am very much into food photography. I haven’t been offered a job like that yet, but that’s what I’d like to do in the near future. Tony – Glad you liked my blog. And thank you for the nice words. I have to warn you about the pomegranate molasses though… You really shouldn’t replace the grape molasses with pomegranate molasses. Grape molasses is very sweet and the closest replacements would be brown rice or agave syrup. Doga – Yes, you should refrigerate the filling until it’s cold, otherwise it will have a somewhat runny consistency. Great gift idea with the wrapping like that! Nice job. My dad and his brothers are all hypoglycemic and he walks around with sugar packets in his pockets! Sylvia – No, there are no clues at all 🙂 Please wait a couple of weeks more and I’ll tell you all about it. This is my first visit and What a lovely find your site is too. 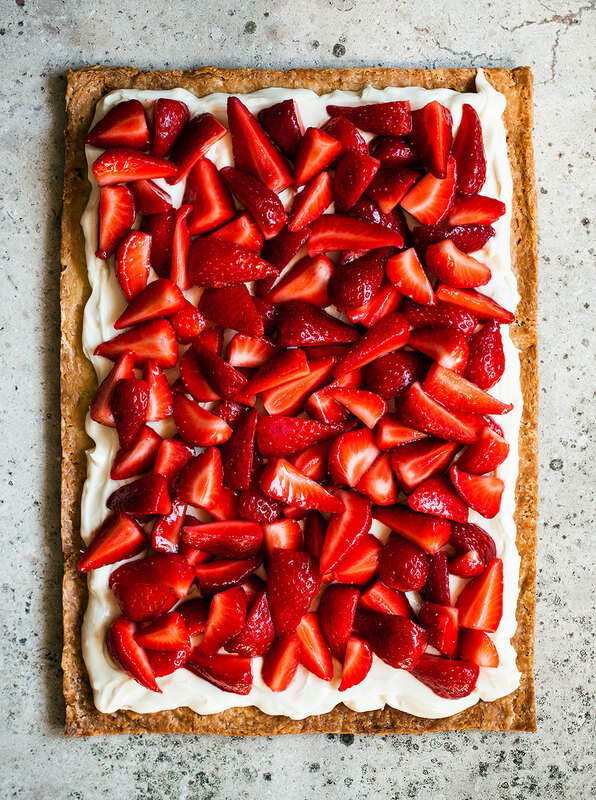 Lovely photos and recipes and then you are a good writer too. My curiosity of what you’ve been up to will bring me back for sure. Those granola bars look amazing!!! Would other berries hold up well in those, like raspberries? Patti – If you can find dried raspberries, those would work great. After a long Bay Area commute, I arrived home to relax and read the newspaper. There was your article in the San Francisco Chronicle and I found it so fascinating, I had to look up your website. After looking at the recipes and reading your comments & the comments of your obvious admirerers (of which I will now become), I have to add my own comment. In a word….Amazing! The Raspberry Tarts look so good! That’s the first recipe I’m going to try! 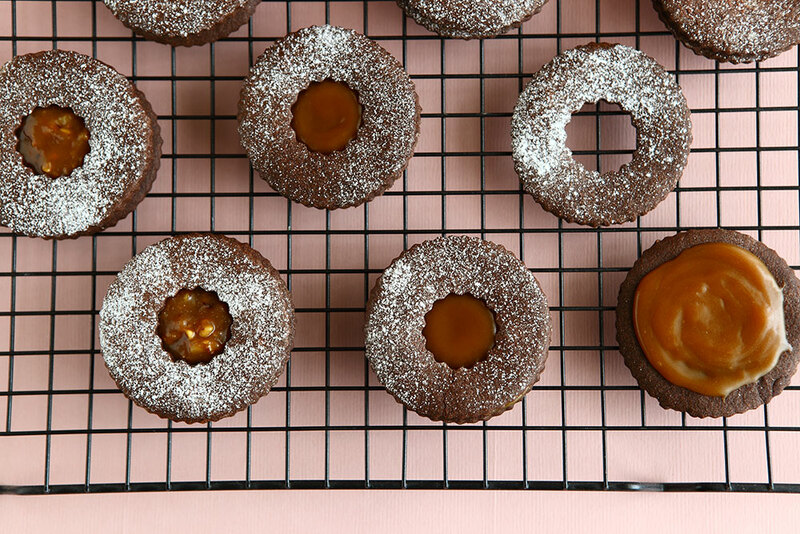 Hello – Did you mark them before the second round of baking? If you did and they still crumbled, you might want to up the honey a little bit so they stick together much better. Hope this helps. Thank for your recipe. It is tasty and healthy. Can you describe what you mean by “mark”? I cut into them about 1/4″ after 30 min and then put them back in the oven for 15 min, but they still crumbled a bit on the top when I cut them again after they had cooled. Not sure if they were crumbly because of that or because I need to add more sweetener (I used honey + agave nectar, as I couldn’t find grape molasses). Ti – Maybe “score” is a better word? Looks like you did the right thing. I think the degree of crumbliness depends on how long you bake them rather than the amount of sweetener.